Describe the basic parameters for determining wind loads on buildings in accordance with the 2015 IBC and ASCE 7-10. Recognize the importance of a continuous load path in minimizing damage to wood buildings in a high wind event. Most regions of the United States face high wind hazards with the accompanying threat of wind-related damage to buildings. According to the Insurance Institute for Business and Home Safety (IBHS), high winds cause millions, if not billions, of dollars of damage each year.1 However, much of this damage could be avoided with a few affordable techniques designed to strengthen buildings against wind forces—techniques that account for interactions between wind loads and building material properties. All buildings are at risk of experiencing damage during high winds. Each structure, with its own unique set of characteristics, such as stiffness, strength and shape, reacts differently to wind loads. However, wood is conducive to meeting the challenges of wind-resistive design. For example, one of wood's characteristics is that it can carry substantially greater maximum loads for short durations than for long periods of time,2 as is the case during high wind events. Wood buildings also tend to be comprised of repetitive framing attached with numerous fasteners and connectors, which provide multiple and often redundant load paths for resistance to wind forces. Further, when structural panels such as plywood or oriented strand board (OSB) are properly attached to lumber floor, roof and wall framing, they form diaphragms and shear walls that are exceptional at resisting high winds. In addition to their other advantages—such as cost-effectiveness and sustainability—properly designed and constructed wood structures complying with building code requirements have proven to perform well during high wind events. This continuing education course provides an overview of wind-resistive design issues in wood buildings with a focus on compliance with the 2015 International Building Code (IBC) and American Society of Civil Engineers/Structural Engineering Institute (ASCE/SEI) Minimum Design Loads for Buildings and Other Structures (ASCE 7-10). 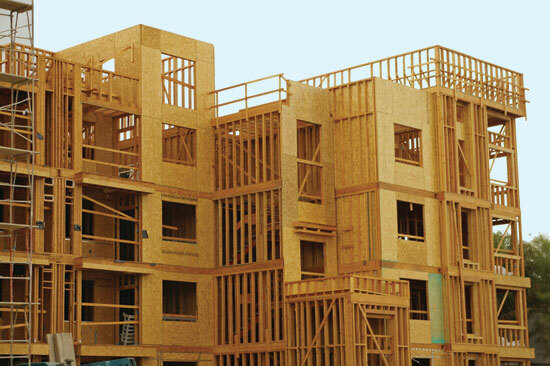 The information on code-conforming wood design contained in this course is based on the American Wood Council's (AWC's) 2015 National Design Specification® (NDS®) for Wood Construction, the 2015 Special Design Provisions for Wind and Seismic (SDPWS) and the 2015 Wood Frame Construction Manual (WFCM).